The Smash-Tech Poacher is a custom hand poured 5 inch line-thru swimbait. 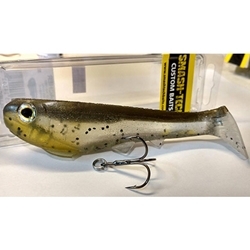 The Poacher is a great choice when you are wanting a bulkier profile and tighter tail kick in a 5 inch bait. Includes Owner treble hook with heavy duty split ring.